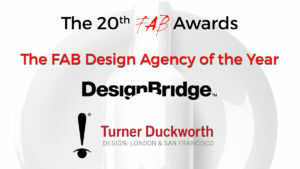 It was a first for The FAB Awards in their 20-year history, as both Turner Duckworth and Design Bridge were named FAB Design Agency of the Year during The 20th FAB Awards Ceremony at the Hurlingham Club in London on May 24th. 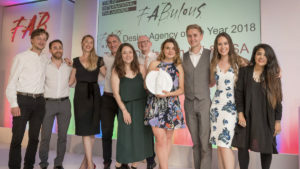 Supported by us, The FAB Design Agency of the Year Award was introduced in 2016 and has been previously won by jones knowles ritchie and Horse. “Never has this happened in our 20-years that two agencies are so evenly matched! The judges were extremely complimentary of both Design Bridge and Turner Duckworth’s projects and were unable to separate them after a long and gruelling judging session. 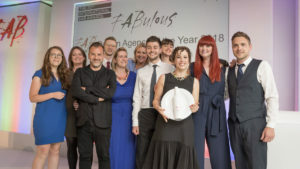 They were both consistently FAB for a number of their clients, making them worthy co-holders of The FAB Design Agency of the Year Award,” commented FAB Awards President, N. Nayar.